Extreme events cause drastic transformations in human settlements; as a consequence, descriptions of the struck environment, based on „quantitative“ spatial data collected before the event, becomes suddenly unreliable. On the other hand, time critical actions taken for responding to extreme events require up-to-date spatial information. Traditional methods for spatial data collection are not able to provide updated information rapidly enough, calling for the development of new data collection methods. Reports provided by actors involved in the response operations can be considered as a source of „qualitative“ spatial information. There has been considerable research on spatial representations and analysis based on metric measurements that lead to the development of Geographic Information Systems (GIS). A different field of research focuses on developing representation and reasoning techniques for dealing with qualitative spatial information that describes qualities and relations holding among objects in space abstracting from quantitative representations. Relatively little work exists on finding techniques to combine the different representation and reasoning methodologies. 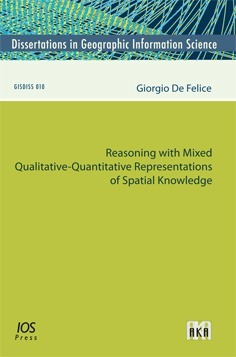 A hybrid reasoning system that combines techniques developed separately for qualitative spatial reasoning and quantitative data analysis is developed in this work. The integrated approach performs different reasoning operations to retrieve new information pieces from a given set. Derived spatial information can be either qualitative or quantitative and complements the given one in supporting tasks related to visualization (e.g., maps and graphics) or querying (e.g., support for decision making). Three main system functionalities are investigated: The first, called quantification, allows for translating qualitative information into quantitative descriptions. The second, called qualification, aims at translating quantitative information into qualitative relations. Finally, the third allows for performing inference operations with information given partly qualitatively and partly quantitatively for boosting the spatial knowledge the system is able to produce.